The earliest settlers who came to live near Sugarloaf Mountain arrived with their religious beliefs. Beginning in the 1700s, the people who settled here made sure that small plots of land were set aside to build a place where marriages could be celebrated, births could be recognized, death could be mourned. They built small churches to meet their spiritual needs, to hold their family and personal celebrations, to provide a setting for larger social events. Churches were places of worship but also organizations that met community needs. From the earliest time, our area’s rural churches identified with many different Protestant denominations; there were also early Roman Catholic churches. Maryland’s history of religious toleration is very deep, but tensions among religious groups did break forth from time to time because many early settlers came to the colonies due to religious strife in England. In 1649, the colony passed the Maryland Tolerance Act, the first law in the British Colonies that mandated religious tolerance. Today we might say that this law had limitations because it defined religious toleration rather narrowly, saying that the majority Protestant population was required to tolerate minority religious people, Catholics and Puritans, with no acknowledgment of other faiths in the wider world. Never the less, Maryland is recognized as one of the birthplaces for the more expansive freedom of religion clause that is embedded in the First Amendment of our U.S. Constitution. Because the Sugarloaf area was sparsely populated and transportation was difficult, the first rural churches tended to be quite small, designed to serve families who lived nearby. Buildings were constructed by local craftsmen on small plots of land, often donated by a family or community leader. They offered a place where people gathered for Sunday services and social events, maybe a schoolroom as well, and land for burials. These early churches often relied on “circuit preachers” – a Methodist or Baptist or Episcopal minister who would travel from one church to another on a fixed schedule. As the population grew and churches added members, there was the opportunity to add a full time minister who would then become a part of the community, adding stability and identity to the congregation. Early in the Sugarloaf area history, churches were built to serve only white members because, prior to the Civil War, black people were prevented by law from gathering, even in a church. Later, when patterns were loosened somewhat, blacks could gather, but only under white leadership. This was true in Maryland and elsewhere, but further north, in Philadelphia and in New York City, black leaders emerged in the late 1790s who objected to these policies and formed all-black denominations that took the names African Methodist Episcopal (A.M.E.) and A.M.E. Zion. But it would be another 60 years, in the 1860s, before all-black churches were created in the Sugarloaf Area. Once this happened, these churches became strong focal points for black people living throughout our rural area. Several sites highlighted on this trail were organized to serve black communities during the era immediately after the Civil War. The tensions that led to the Civil War played out in our area churches. The denomination that most frequently formed churches throughout the Sugarloaf Region was Methodist, an evangelical denomination whose roots trace to England. Beginning in 1700s, Methodists began vigorous missionary work throughout the British Empire, including to America before the Revolutionary War, especially in the mid-Atlantic area. Our trail includes many Methodist churches in part because this denomination predominated in northern Montgomery County, but also because of what happened later, as the country drew closer to the Civil War. In the 1850s, there came to be strong divisions within Methodism over the issue of slavery, with the northern churches supporting abolition of slavery. Many of these churches were active in assisting the Underground Railroad. Other congregations were either against abolition or did not want to take a stand – they became a separate denomination called the Methodist Episcopal Church South, or later, Southern Methodists. While this was a large national division, it was also a painful local rift. Many historic Methodist congregations in the Sugarloaf Region split in two, with a group of members leaving to build a separate church and a separate identity just down the road. These local divisions happened in the mid-1850s and for the most part lasted until 1939 when the northern and southern branches of Methodism reunited and took the name United Methodist. Moving our thinking now to the time after World War II, we come to the beginning of suburban development in Montgomery County. During this era, extraordinary numbers of residential and commercial areas were built in the lower parts of Montgomery County and churches there added members. But in Sugarloaf’s rural setting, where agriculture was the primary land use, housing remained sparse and churches remained small. Some church buildings in our area were re-built during this period, and others, in Poolesville, for example, expanded at this time. But for the most part, our Sugarloaf landscape remained dotted with small wooden or brick buildings serving congregations of neighbors. Gradually, local elected leaders sorted out pros and cons of PIF expansions, with a main concern being that large institutional uses permanently took land out of agricultural use. In 2005, the Montgomery County Council ruled that there would be no more extensions of public water and sewer lines into the rural zones to accommodate PIFs. A few months later, the County added to the restraint on PIFs by limiting the size of private sewerage treatment plants for institutions not served by public water and sewer. Thus, the local government assured that any new rural church would be closer in size to what has been traditional in the Sugarloaf Region. This Rural Churches Trail is a driving tour. As you explore, you’ll see several sites that were developed in recent years when denominations began to expand into rural areas, and also churches with a long history near Sugarloaf, some longer than 200 years. You will also see a variety of faith traditions on your tour. If you are interested in genealogy, you may want to spend extra time in three interesting cemeteries -- an old community cemetery, a small family cemetery and a modern denominational cemetery. You can also visit cemeteries at many church sites. This tour takes you to fifteen sites. Other trails on this website feature places of worship, but you’ll notice that the Rural Churches Trail does not repeat any site that is on another trail. If you want to see a list of all area churches, here is a special chart with all Sugarloaf area places of worship identified, including those churches that are on other trails. The Rural Churches Trail can be driven East to West, or vice versa. Our list begins at the eastern end, with Site 1 located about a mile from I-270. Driving directions assume you are going east to west. If you have a good map or GPS, it will be easy to drive this trail in the opposite direction, beginning at Site 15 on River Road, the western-most site. Leave I-270 at Clarksburg, Exit 18, and go east on Stringtown Road. Approximately 1.3 miles from the exit ramp, just after you cross Snowden Farm Parkway, the church will be on your left. This new building is a non-denominational evangelical church. The congregation itself is new -- it began meeting in a Gaithersburg movie theater in 1989 -- and as it grew, it was able to purchase land in Clarksburg. The congregation moved into this building in 2000. Cedarbrook serves a wide geographic area, with member families arriving from Frederick and Gaithersburg and many points in between. The building is also home to Cedarbrook Academy, a school whose purpose is to oversee home schooling of children (grades K-12) from a number of churches in the area. 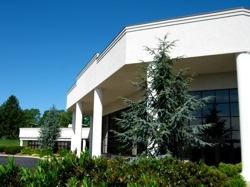 Cedarbrook’s large building (approximately 28,000 square feet) is surrounded by open space. Although this church is adjacent to an area of dense housing, it is actually located on 13 acres of land zoned for agriculture. Cedarbrook identified this site at about the same time that the new town of Clarksburg was being planned, allowing the congregation to build its facility near the town but not in it. Cedarbrook, along with several other sites on our Rural Churches Trail, is an example of the recent trends in church location decisions described in the introduction. Directions to next stop: Return to the intersection of Stringtown Road and Snowden Farm Parkway and turn right. When Snowden Farm ends, turn left onto Clarksburg Road, Rt. 121. Before you get to Route 355, Fredrick Road, Spire Street will intersect on your left side. Turn left here. 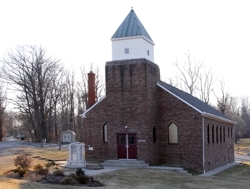 Spire Street, just one block long, is named for the very recognizable spire of Clarksburg United Methodist Church, built on a hill overlooking Route 355, Frederick Road. This small white frame church is home to one of the oldest faith communities in Montgomery County. Its history begins in 1788, just one year after the founding fathers met in Philadelphia to adopt our U.S. Constitution. Methodism was one of the first religions to spread to Montgomery County after the Revolutionary War. Its missionaries had arrived in the area to the north of Sugarloaf Mountain even earlier, in the 1760s. Clarksburg began as a tiny village at that same time due to its location on “The Great Road” (now Rt. 355). This road began as an 18th century two-lane dirt (often mud) road connecting the Port of Georgetown to the town of Frederick, Maryland. John E. Clark was a local leader who understood that this area 30 miles north of Georgetown was a convenient overnight stopping place for travelers. He founded a town that bears his name and, in fact, for some years the Town of Clarksburg was one of the major towns in northern Montgomery County. Because of the Clarksburg’s prominence on The Great Road, in 1788 it became the site of an early Methodist camp meeting served by a “circuit preacher” who also preached at two nearby Methodist congregations, one in Goshen and one at the Sugarloaf Chapel on Rt. 109. Neither of these old congregations now exists, so Clarksburg Methodist Episcopal, later called Clarksburg United Methodist, has the honor of being Montgomery County’s oldest continuous religious congregation. The first church building (called Ebenezer Chapel) was constructed on this site in 1794. It was a log building with no plaster, no decoration, just plank benches and a plain board floor. Fifty years later, in 1853, the congregation erected a more substantial brick building; local red clay was used to make the bricks. This building had two stories, with the upper balcony reserved for black residents of the community. Then in 1909, the congregation built its third building, the one you see today. The wood timbers that frame this building came from forests on local farms. As described in the introduction to this trail, Methodism fractured into two denominations at the time of the Civil War -- the issue was slavery. A split happened in Clarksburg as well: in 1865 part of the congregation left to form a new Southern Methodist Episcopal Church in town. The two groups rejoined in 1940, deciding to keep the original building for worship, with the newer (Southern M.E.) building becoming the church social hall. That lasted until 1959, when the social hall was sold. The congregation added an education wing to the church in 1963 and changed its name to Clarksburg United Methodist in 1968. Before you move on, take some time to stroll through the adjacent cemetery. Directions to next stop: Go to the traffic light at the intersection of Clarksburg Road and Rt. 355, then head north on Rt. 355 for one mile; turn left on Comus Road. As soon as you turn onto Comus Road, look left. Sitting atop a grassy hill is a small brick building with a white steeple. This church was built originally for the Clarksburg Baptist Church, but in 1998, it became home to the Clarksburg Seventh Day Adventist Church (formerly known as Upper Montgomery Seventh Day Adventist). This congregation is relatively new in the Sugarloaf area, drawing families from Frederick and Montgomery Counties. Members first met at an elementary school in Germantown, later rented space in a middle school in Clarksburg and were pleased to discover a small church building for sale at a location convenient to all. The building has a small sanctuary, room enough for about 75 people, and is on a two-acre site. For a short time after the Baptist congregation moved, the building had a non-religious use: it was a disco. When the new congregation moved in, members removed a mirrored ball suspended from the ceiling and repainted the black walls. Both congregations, buyers and sellers, were pleased to return the building to a sacred space. Directions to next stop: Continue on Comus Road for about ¼ mile, crossing over I-270. The first driveway on your right after crossing the interstate highway has a tall stone wall with an engraved granite stone to mark the entrance to the Garden of Remembrance. If the metal gates are open, you may want to visit this serene modern cemetery, The Garden of Remembrance. This is a Jewish cemetery opened in the 1990s by a board of Jewish leaders who wished to provide a facility open to all branches of their faith community. 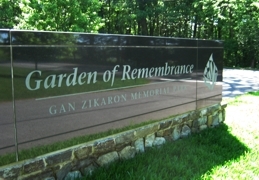 Twenty Jewish congregations in the DC metropolitan area now partner in operating this cemetery; individuals who are not affiliated with a congregation may be buried here as well. The facility has 152 acres of grounds, pathways and structures designed to respect the beauty of the landscape and the traditions of the Jewish faith. It includes a mausoleum and an open-air gazebo for gatherings and ceremonies with plans to add a chapel when funds become available. In accordance with Jewish religious practices, the Memorial Park is closed on Saturdays and on the first day of major Jewish holidays. Daytime visiting hours are posted on the gates at the entrance. If there is a funeral going on when you visit, please respect the meaning of the event and privacy of the participants. This is a religious site, though not formally a place of worship. 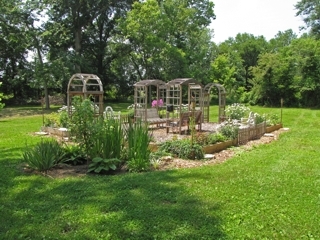 Both the Garden of Remembrance and the Cedarbrook Community Church (Site 1) are religious organizations that found rural sites to meet growth needs. The same is true for Site 15 on our tour, the Kunzang Palyul Ch’ling Buddhist Temple. All of these facilities serve families and individuals from communities far beyond the Sugarloaf Region yet fit in very well with the beauty of the surrounding area. Directions to next stop: Turn right when leaving the Garden of Remembrance and continue on Comus Road. Go two miles to the second stop sign, Old Hundred Road. Turn left. In about ¼ mile you will see an unmarked gravel driveway on your right; it leads into a small flat grassy area. Pulling into this driveway will allow you to get off the busy road for a brief look at a unique old church, but please note that this is private property. Near the driveway you will see a wooden one-story building that is quite overgrown with vines and shrubs. Behind this building is a small cemetery. For about thirty years, until 1939, this was a Seventh Day Adventist Church. It was built in 1917 by a local resident, Ralph Dennison, who had moved with his family from Washington, DC to a farm in the country. When he saw there was no nearby church to serve his family and others of his denomination, he built one. He wisely put a tin roof on the building and it is this roof that even today protects the building from decay. A granddaughter of Mr. Denison lives near Laytonsville and now belongs to the Clarksburg Seventh Day Adventist Church (Site 3). She recalls attending this small church as a child and said her parents met there at a “community sing.” The larger room you see was the sanctuary, with the small room at the back added later as a place for the children to gather. Even after the small local congregation ceased to meet here, six members kept their names formally on the rolls of the church so the site could continue to be owned by the Potomac Conference of Seventh Day Adventists and the land could be used for burials. When the last of these members died in the mid-1960s, the property was sold to a neighboring farmer whose family continues to own it today. Directions to next stop: Re-enter the paved road, going back the way you came on Old Hundred to Comus Road, then turn left, toward Sugarloaf Mountain. A few miles along Comus Road, turn right on Barley Fields Road and go all the way to the circle at the end. As you come round the circle, on your right will be a small plot of land surrounded by a fence. 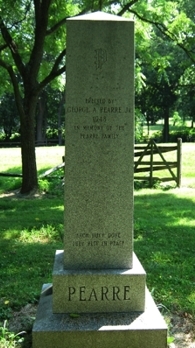 This is the Pearre Family Cemetery. James Pearre was an early settler in the Comus area. In the early 1770s, he received a land grant that encompassed several hundred acres near the base of Sugarloaf Mountain, land that now straddles the line between Frederick and Montgomery Counties. Today, you see large new homes and a modern road, but for many generations, this land was farmed by descendents of the original Pearre settlers. The property stayed in the Pearre family for many generations, until it was finally sold in 1948. The small cemetery, owned and managed by a family trust, is a memorial to the family’s history in Comus. Members of the Pearre family still live in the general area near Sugarloaf Mountain. If you inspect the various headstones and the Pearre Family monument, please respect the gravesites and leave nothing behind but your respect. This family cemetery is representative of dozens (perhaps hundreds) of such burial sites that dotted the landscape around Sugarloaf Mountain over the centuries. As you will learn later at Monocacy Cemetery, many of our area’s old family cemeteries no longer exist at their original locations but some families have moved their ancestors’ gravestones to Monocacy. Directions to next stop: Return to Comus Road and turn toward Sugarloaf Mountain. Before you get to the mountain entrance gate, you will pass Sugarloaf Mountain Vineyard, which is a stop on our New Farm Trail. If the tasting room is open, you can get a snack here and perhaps enjoy a taste of local wine. Sugarloaf Mountain is a unique place whose geology, natural environment, history and recreational opportunities are described elsewhere in our trail guides. You may wonder why a trail of rural churches has brought you to a site known for hiking and wildflowers. Once a year, Sugarloaf Mountain’s East View Overlook is the site of a community religious event: an Easter Sunrise Service. Just before dawn each Easter Sunday morning, hundreds of people from near and far gather to watch the sun come up and recall the Biblical story of Easter morning. A men’s group at the Neelsville Presbyterian Church in Germantown first organized this event as a community project in the mid-1950s. Other nearby churches joined in so from the beginning it has had an ecumenical aspect. Today the ceremony is sponsored and organized by nine congregations in the Sugarloaf area, including churches in Boyds, Dickerson, Poolesville, Rockville, Barnesville, Germantown and Frederick. Your visit will be during daylight hours, but we ask you to imagine East View on a dark, clear chilly morning. The rolling hills gradually come into view as the sky lightens. Slowly, you can make out houses and barns and roads. Often, white clouds of mist hang in the low valleys. As the skies redden and eventually the sun appears, the quiet conversation of the crowd changes to a celebration in prayer and song. Directions to next stop: Drive down the mountain and at the entrance area, turn right on Mt. Ephraim Road toward Dickerson. In about 1.5 miles, turn left on Barnesville Road. Your next stop will be in the Town of Barnesville. As you enter Barnesville on your way to the Barnesville Baptist Church, you will pass by St. Mary’s Shrine of Our Lady of Fatima Catholic Church. The description of this sanctuary can be found as a stop on the Barnesville Town and Surround Tour. Behind this church is a cemetery of historic interest: most burial sites are those of local families but there are also graves for people who died during a cholera epidemic while building the C & O Canal and burial sites for Civil War soldiers. The hilltop setting of this traditional, evangelical Southern Baptist Church sits amid a sheltering stand of large white oaks and serves as a landmark in the charming town of Barnesville. The building’s cornerstone was laid in 1869 and on September 24, 1871 the church was dedicated. Since then, the building has undergone two major renovations. In the 1950s a two level addition was constructed. The lower level includes a nursery and Fellowship Hall and the upper level has rooms for Sunday school classes, a library, choir room, and a pastoral office. The second renovation in the 1980s added new siding, a solid concrete wall around the perimeter of the building and new pews for the growing congregation. Some of the church’s original pews are in the balcony area of the sanctuary. Other improvements include an outdoor entrance ramp and play equipment for the youngsters. 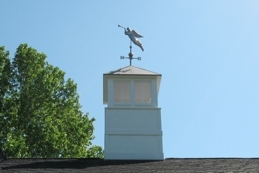 In 2005, the century-old bell tower was refurbished and the tin roof was replaced with a new green metal roof. Through all these renovations the structure has retained its original rural Federal architectural style with white clapboard siding, bell tower and tall paned windows. The Church also owns the parsonage that sits on an acre of land adjacent to the sanctuary. The dwelling is a brick Cape Cod design, and a concrete walkway extends from the parsonage to the church building. The congregation is a close-knit fellowship of extended families that continues the legacy of the farming community that founded the Church. Directions to next church: Go west on Barnesville Road 0.2 mile into Barnesville, then turn left on Beallsville Road (Highway 109S) and drive 1.8 miles. Mt. Zion-Warren United Methodist Church is on the right. Another building known as the Old Meeting House occupied this site before the current church was constructed. It was a multi-purpose building that served the residents of the Mt. Zion’s African American community as a church, as well as a school and meeting hall. Records indicate that in 1876 Reverend Elijah Awkward (or Awkard) was the first pastor at the Meeting Hall. He served this congregation and three others in the area: Warren, Elijah and St. Paul’s Church. The Reverend died in 1883 and is buried on the hill in Mt. Zion Cemetery. Elijah United Methodist Church in Poolesville (Site 12 on this tour), formerly known as Elijah’s Rest Methodist Church, was named after him. Around 1885, the present church was constructed. In 1893 six acres were deeded to the Church to provide additional land for the church and the construction of a parsonage. Pastors and their families resided in the parsonage until it burned in 1915. In the late 1920s, 2.5 additional acres were deeded to the Trustees of this church. Around that time, the pastor’s duties were reassigned to two churches, Mt. Zion and Warren Chapel at Martinsburg (which became Warren United Methodist Church). Over the following years, many improvements have been made to the church and grounds. In 1937 the church was remodeled inside and the bell tower and vestibule added. In 1972 the exterior of the church was bricked and a front extension added. Modernizing efforts continued in the 1970s and 1980s included a screened porch addition to the parsonage, renovating the kitchen, adding a handicapped ramp, paving the parking lot and adding new pews. In July 1993, Mt. Zion and Warren* churches voted to merge as one and in October this church became Mt. Zion-Warren United Methodist Church. *Warren United Methodist Church, built in 1903, is located in Martinsburg, Maryland, west of Poolesville. The church, meeting house and school were the center of a thriving post-Civil War rural black community that at its height included some forty residences owned by black farmers and laborers and their families. The Warren Historic Site Committee, Inc., a non-profit organization established to preserve and restore the site, is currently maintaining it. Directions to next site: Head southwest on Beallsville Road for 1.8 miles, at the light turn right on Darnestown Road (Highway 28 W) and at the first left (just 258 feet) turn left on W. Hunter Road. The Cemetery is on the right as you turn. Monocacy Cemetery occupies the property that was once the site of an Episcopalian church called the Chapel of Ease of All Saints parish (also known as the Monocacy Chapel). Records indicate that the chapel was here as early as 1737, well before the Declaration of Independence. At that time there were few churches in Maryland and this was one of only two Anglican places of worship located between Rock Creek in Washington, D.C. (30 miles southeast of this point) and Frederick, Maryland (20 miles north). The old church was torn down and rebuilt in 1747, and then again in 1760. Ten years later when the parish of Montgomery expanded, St. Peter's Episcopal Church took possession and it became known as Old St. Peter’s Church. During the War of 1812, this site served as a camping ground for the American Revolutionary forces. In 1849, the congregation moved to a new church in Poolesville, leaving the old place of worship empty. During the Civil War, Union soldiers destroyed the building, taking it apart for firewood and materials needed to build other things. In January of 1872, the vestry of St. Peter's transferred the churchyard over to the newly formed Monocacy Cemetery Society of Montgomery County, which was chartered by the state of Maryland and comprised of local leaders. The land then became a public cemetery and burials began taking place shortly afterward. The oldest marked graves in Monocacy Cemetery are from the 1790s but there are unmarked graves from the 1730s and 1740s. Over the years, many of the stones in this cemetery were brought from other graveyards, mostly family burial grounds in the Sugarloaf area. The 13-acre cemetery is the final resting place also for about 6,000 people from Beallsville, Poolesville, and the surrounding area. The stone chapel that sits at the crest of the hill in the northeast corner of the cemetery was built by the United Daughters of the Confederacy in 1915 in memory of Confederate soldiers buried in this cemetery. A stone tablet near the driveway lists the names of the Confederate dead in the cemetery. Directions to next church: Turn left on to West Hunter Road and then turn right onto Darnestown Road (Highway 28). Continue straight ahead after the stoplight for 1.0 mile and then turn right onto Jerusalem Road. Continue on for 0.9 miles and turn right onto Jerusalem Church Road. The church is the first building on the right. This small brick church sits in the heart of the Jerusalem community, established here by African Americans more than 150 years ago. The first church members met in a log home built in 1874. At that time it was one of the few black Baptist churches in Montgomery County. In the early 1900s a two-story frame building was constructed by a local resident, George Dorsey and served as the chapel. When that structure burned, a new church was built in 1922 at this location on land donated by the Clarke family. The small, well-kept cemetery behind the church is owned and maintained by the Jerusalem Baptist Church. Directions to next stop: Turn right onto Jerusalem Road and continue southeast for .07 miles. Turn left on Beallsville Road (Highway 109) for .02 miles. Elijah United Methodist Church is on the right. The original church on this site was built in 1871. At one time, there was also a community building, known as Loving Charity Hall, behind the church. As there were no public schools for African American children at the time, it served as the site of a school for the children in this area and the Jerusalem community (site 11). When the original church was destroyed by fire, the present sanctuary was built in the 1950s. A tree-shaded cemetery is located on the west side of the road behind the church and is outlined on three sides by a wooden picket fence. Burials here date from the 1870s and serve as the final resting place for members of the Church, which was started by free African Americans shortly after the Civil War. The cemetery is still in use and has more than 100 known burials dating from that time. Depressions in the ground with markers indicate many unmarked graves. Directions to next stop: Turn right onto Route 109/Elgin Road and drive 0.5 miles into the town of Poolesville. Go left (SouthEast) at the four way stop turning onto Fisher Avenue. Go 4.6 miles to 16500 Whites Ferry Road, where you will find the Dawsonville Mennonite Church on your right. Note: Several churches in the town of Poolesville are featured on the Poolesville Walking Tour. For example, Poolesville Presbyterian Church, where Confederate soldiers surrounded Union troops during the Civil War, will be on your right before you reach the four-way stop. If you turn right on Whites Ferry Road, you’ll see St. Peter’s Episcopal Church, one of the oldest church building in Poolesville, built in 1849. 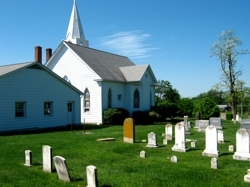 The congregation is much older than the building – its roots go back to Colonial times and a small chapel located on the land we now call Monocacy Cemetery (Site 10). If you take time to investigate the town, you’ll see several restaurants where you can stop for refreshments before proceeding east on Whites Ferry Road toward the next stop. The double doors on the east side of the church are wooden paneled and have a large round-headed multi-paneled stained glass window above them. The other windows are double hung with six over six divided panes and rounded heads flanked by green wooden louvered shutters that repeat the windows design. The church has a standing seam metal gable roof. A plaque with the date of the church’s construction can be found at the peak of the east gable. The building was occupied until the early 1950s when the congregation disbanded. A few years later, a Mennonite group leased the building and in 1976 its ownership was transferred to the Dawsonville Mennonite Church. At this time, the Montgomery County Historical Society asked the congregation to consider putting the property into a Historical Deed of Trust. While not choosing to make that change, the congregation did commit to maintain the architectural appearance of the original design. In 1979, an addition that included a fellowship hall with kitchen facilities, fireplace, classroom space and a nursery was added. There is also a prayer garden in the rear that is open to the public. The members of the Dawsonville Mennonite Church celebrated their 50th Anniversary on September 21, 2003. Directions to next church. As you leave the church property, turn left (west) on Whites Ferry Road Route 107 to the next road and then make a left onto Sugarland Road. Turn left onto Sugarland Road and drive 3.4 miles. Turn right to stay on Sugarland Road and drive for 0.7 miles. St. Paul’s Community Church is on the right. This historic church was built in the center of a community known as Sugarland Forest. Freed slaves who purchased the land from local white owners established the community in 1871. By 1900, there were about 40 families living and working on about 200 acres. It was a self-sufficient African American township comprised of a church, school, post office and store. Freed slaves from a former white slave owner purchased the land for the church for $25 on October 6, 1871. The deed describes its purpose as a place for religious worship, a school, and as a burial site for people of African descent. In 1893, the church was built by W. Scott Beall. 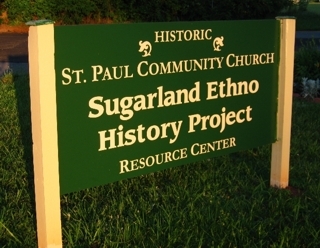 The original structure, known as the Sugarland Forest Methodist Episcopal Church, burned. In its place a community hall was built in 1930. Directions to the last stop. Turn left out of the church property and go northeast on Sugarland Lane for 0.4 miles. Sugarland Lane becomes Sugarland Rd. Go 1.8 miles and then turn right at the intersection of Partnership Road. Go 1.7 miles and turn right onto River Road. The Kunzang Palyul Ch’ling Buddhist Temple will be on your left. The Kunzang Palyul Ch’ling Buddhist Temple is a center for Buddhist study and spiritual practices. It was founded by Jetsunma Ahkon Llamo (Alyce Zeoli) in the tradition of Vajrayana Buddhism. In the beginning, the community met in Kensington, MD, but moved to River Road (a house on seven acres) when it outgrew that original space. Since April 1985, it became a World Prayer Center where a 24-hour prayer vigil dedicated to the end of suffering for all sentient beings takes place. Inside the Temple is the Dharma room for teaching, a crystal collection in the prayer room, a solarium where one can get tea and snacks, and a gift store. The Temple is open 365 days of the year, 24 hours a day, free of charge to all faiths. A part of the 72-acre Temple complex today is the 65-acre Stupa Peace Park, located across River Road from the KPC Temple. The park, open to the public during daylight hours, has many peaceful miles of walking trails that lead to meditation gardens and stupas, which are consecrated structures considered to embody the mind of enlightenment. There are also two animal welfare rescue centers on the grounds. One is the Garuda Aviary that has been in operation for more than 20 years sheltering rescued parrots. And the other is Tara’s Babies Animal Welfare, a facility that works in conjunction with a larger rescue shelter in Payson, Arizona. The shelters were originally founded to help dogs displaced during Hurricane Katrina. You’ve now reached the end of The Rural Churches Trail. Thank you for sharing our interest in the culture and history of the Sugarloaf Mountain region. We hope you will add comments about your visit to our blog.